It was this restaurant, new at the time, that a local volunteer fire department called when ice and traffic converged to cause calamites, fatalities and fires. Prolonged, massive standstill meant there was need for food. The café was closed, but Barry Doyle packed up some coffee and hot biscuits and drove to the scene -- repeatedly. His efforts ended up feeding hundreds that day. Barry Doyle (right) delivers provisions in western North Carolina. Word of his good deeds spread, and soon Barry was being asked to help boots-on-the-ground efforts throughout the Triangle, state and beyond. Eventually, the work became more formalized through the creation of an organization devoted to the cause called the Feed the Firefighters Foundation. All told, thousands of calls for help were received through the Foundation over the years, according to Barry’s wife Denise Doyle, who now runs both the organization and 26-year-old café with assistance from daughter Catherine, a grad student at NC State. The Foundation was particularly proud to provide notable support after 9/11, when the group partnered with the NC Restaurant and Lodging Association to raise more than $2 million for the families of first-responders in New York City. Barry received many firefighter helmets and plaques in appreciation from various NYC precincts. 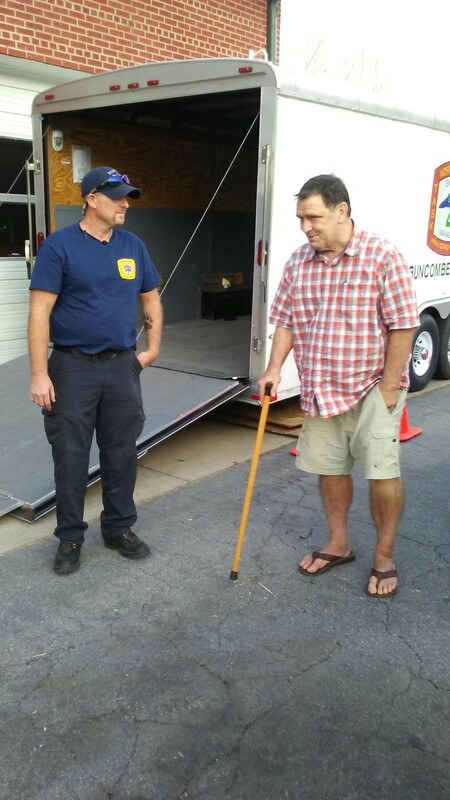 Fritz, who serves as senior vice president on the board of the Feed the Firefighters Foundation, said that requests for food assistance began to diminish dramatically over the years, due in part to procedural changes among local firefighter groups. “Firefighters are now on a rotational system and not on call for such long periods of time, and they also have been provided with the means to buy food,” he said. The Foundation was being called less and less for food assistance, which was central to its original mission. 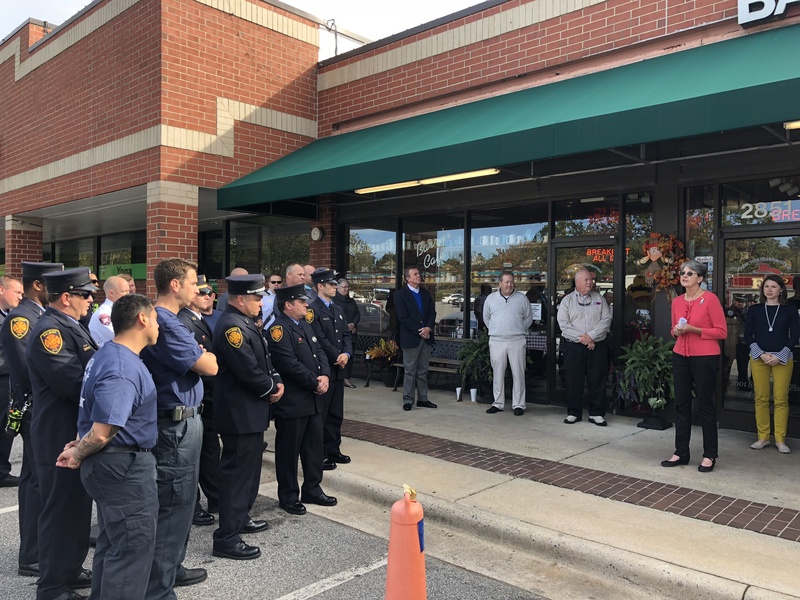 Denise Doyle, center, thanks everyone for attending the ceremony to kick off the Barry J. Doyle Scholarship to benefit firefighters in Wake County. After Barry’s death in 2017, both Denise and Fritz said the Foundation board determined that they wanted to keep Barry’s legacy alive and began researching how that could be accomplished. Another board member and attorney, Steven Glass, recommended establishing an endowment with the North Carolina Community Foundation. “The board evaluated the pros and cons and determined this was the safest way to ensure that we could maintain the purpose of the fund, which would ensure that Barry’s legacy would be permanent,” Fritz said. So, the Barry J. Doyle Scholarship was established to help defray educational expenses for those pursuing firefighter certification and training in Wake County. It honors a man whose passion for food, helping people and assisting rescue workers combined to create an organization devoted to supporting boots on the ground when they needed it most. “We know how hard first responders work,” said Denise. “Most have two jobs and are constantly required to re-qualify for their rescue work.” The Barry J. Doyle Scholarship will help defray expenses for those pursuing firefighter certification with the goal of working in Wake County. If you’re interested in making a gift to the Barry J. Doyle Scholarship, simply click here to make an online donation, noting its purpose in the box; or mail your gift to the North Carolina Community Foundation, 3737 Glenwood Ave., Suite 460, Raleigh, NC 27612.